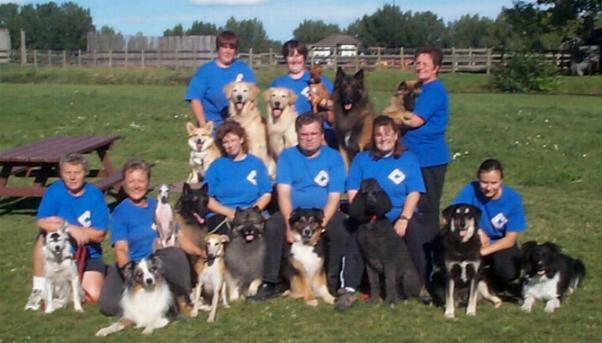 The Pawsitive Energy Flyball Teams are the teams of the Fort Saskatchewan and Area Canine Association. Fort Saskatchewan is located just northeast of Edmonton, Alberta in western Canada. Our team consists of over 20 active or upcoming dogs. Several of our dogs have also retired from the sport of Flyball. The human half of our team is made up of over 15 Flyball enthusiasts. We are proud of our diversity of breeds, as our team boasts more than a dozen distinct breeds as well as our "all canadian" contingent. In cooperation with the Fort Saskatchewan and Area Canine Association, Pawsitive Energy holds an annual Flyball tournament. The tournament location has changed this year, to the Ellerslie Curling Rink, in south Edmonton. This should be closer for our friends from Calgary! Teams are treated to Alberta hospitality, fun, and lots of Flyball. Our teams also enjoy getting away to compete in other venues. We have travelled to compete in tournaments in Alberta, Saskatchewan, Manitoba, and British Columbia. We also hope to visit the USA for some tournaments in warmer surroundings sometime in the future.